I’ve known Mr. Shadeed for a little over two years and his coaching has been invaluable. A lot of my brands’ growth over the past year is a direct result of his tips, inspiration and feedback. Mr. Shadeed has just published his latest eBook and it’s available for free! In The Basics Of Building Your Brand Mr. Shadeed provides an overview of what it takes to get started and some of the key elements of solidifying the foundation of a successful personal or corporate brand. Topics in the book include what is a brand?, 3 benefits to owning your domain, the differences between file sharing sites vs. your own domain, plus more. 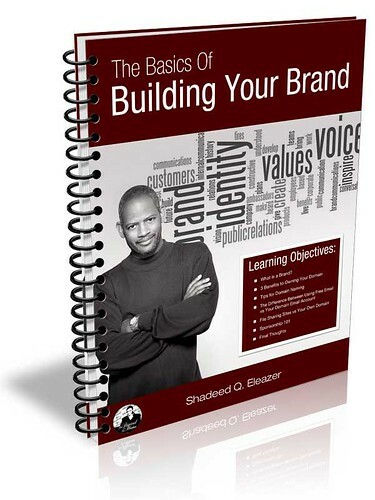 You can download The Basics Of Building Your Brand for free via Mr. Shadeed’s website. He also has an additional item available, The 7 Motivations Of Today’s Blogger, for $2.99. Listen to Mr. Shadeed every week on Mario Armstrong’s Sirius XM Radio show, "The Mario Armstrong Show", which airs daily on Sirius 128 The Power, Monday-Friday. In the meantime, you can check out Hip Hop Bytes Episode 14 where Mr. Shadeed talks Online Influence & Hip Hop Culture. This entry was posted in Business and tagged Mr. Shadeed. Bookmark the permalink.